This trail runs from the turn off to Bartlett Lake into Fountain Hills and should last about 2 hours. Canyon de Chelly was established on April 1, 1931 as a unit of the National Park Service. It is located in northeastern Arizona within the boundaries of the Navajo Nation. It preserves ruins of the early indigenous tribes that lived in the area, including the Ancient Pueblo Peoples (also called Anasazi) and Navajo. The monument covers 83,840 acres (131.0 sq mi; 339.3 km2) and encompasses the floors and rims of the three major canyons: de Chelly, del Muerto, and Monument. These canyons were cut by streams with headwaters in the Chuska mountains just to the east of the monument. Canyon de Chelly is unique among National Park service units, as it consists entirely of Navajo Tribal Trust Land which remains in the ownership of the Navajo Nation and is home to the canyon community, while park matters are administered by the National Park Service. Access to the canyon floor is restricted, and visitors are allowed to travel in the canyons only when accompanied by a park ranger or an authorized Navajo guide. The only exception to this rule is the White House Ruin Trail. Most park visitors arrive by automobile and view Canyon de Chelly from the rim, following both North Rim Drive and South Rim Drive. Ancient ruins and geologic structures are visible, but in the distance, from turnoffs on each of these routes. Tours of the canyon floor can be booked at the visitor center and at lodgings in the vicinity of the canyon. There is no fee to enter the canyon, apart from any charges imposed by tour guides. Accommodations for visitors are located in the vicinity of the canyon, on the road leading to Chinle, which is the nearest town. The National Monument was listed on the National Register of Historic Places on August 25, 1970. 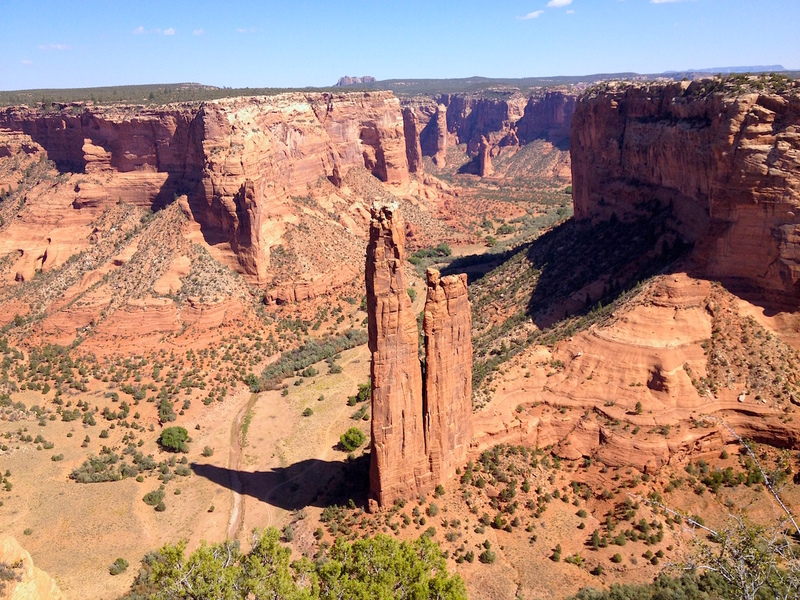 The park's distinctive geologic feature, Spider Rock, is a sandstone spire that rises 800 feet (240 m) from the canyon floor at the junction of Canyon de Chelly and Monument Canyon. Spider Rock can be seen from South Rim Drive. It has served as the scene of a number of television commercials. According to traditional Navajo beliefs the taller of the two spires is the home of Spider Grandmother. Location depicted are the major cross streets near Carlos' home. 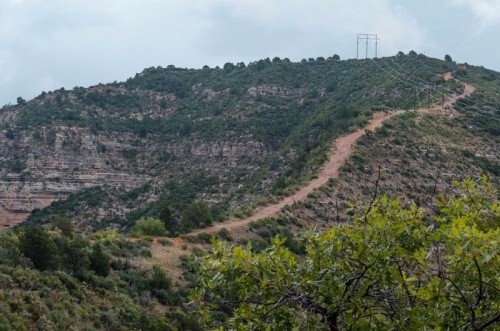 The oldest known history of Casner Mountain is that it was used by the Casner family in the 1880s as a route for moving cattle from the Verde Valley in the Winter months to the top of the Mogollon Rim during the Summer months (or more likely the adjacent Mooney Trail). The off-road trail was developed more recently for use by the utility companies to build and maintain high voltage power lines. Much of the Casner Mountain Trail is squeezed in between the Sycamore Canyon Wilderness and Red Rock-Secret Mountain Wilderness offering awesome views of both (and forcing you to keep your vehicle on the trail); along with the famous red rock country of the northern Verde Valley. The Verde Valley encompasses about 714 square miles in the center of Arizona and has hundreds of miles of dirt roads and off-road trails throughout it. You'll have to drive some of them to get to or from the southern trailhead of Casner Mountain Trail. This entire area is the height of Arizona's physical beauty and you'll get an excellent view of it along the Casner Mountain Trail. While most of these off-road four-wheel drive trails are mainly within the control of Coconino National Forest, some also extend into Prescott and Yavapai National Forests; which you can also see parts of from this trail. 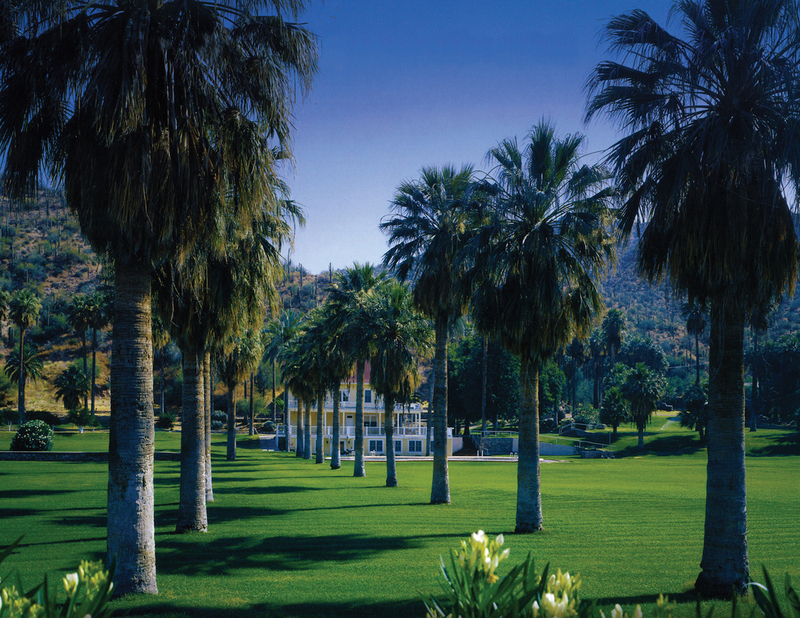 Castle Hot Springs also served as the first territorial capital of Arizona as well as a retreat for many wealthy businessmen, politicians, and even presidents of the United States. During its time as the territorial winter capital of the Arizona Territory, Castle Hot Springs was both the residence of the Territorial Governor and a local jail. Castle Hot Springs attracted many of America's wealthiest and most well-known families, including the Rockefellers, Carnegies, Cabots, and the Wrigleys. United States Presidents; including Theodore Roosevelt, Warren Harding, Woodrow Wilson, and Herbert Hoover also stayed there. John F. Kennedy actually spent three months at the resort in 1945, when he was recovering from wounds received during World War II as a Naval officer. The actor, Clark Gable and actress, Carole Lombard also spent their honeymoon at the resort. The author, Zane Grey also stayed there. AZLRO promotes safe off-road driving, supports the "Tread Lightly" program is active in maintaining access for off-road driving as we explore all the great state of Arizona has to offer. Subscribe to our email list and join us at a monthly meeting our out on the trail. Copyright © 2015 AZLRO. All Rights Reserved.